Chytrids are the most primitive group of fungi and the only group that possess gametes with flagella. The first recognizable chytrids appeared more than 500 million years ago during the late pre-Cambrian period. Like protists, chytrids usually live in aquatic environments, but some species live on land. Some chytrids are saprobes while others are parasites that may be harmful to amphibians and other animals. Chytrids reproduce both sexually and asexually, which leads to the production of zoospores. Chytrids have chitin in their cell walls; one unique group also has cellulose along with chitin. Chytrids are mostly unicellular, but multicellular organisms do exist. The kingdom Fungi contains five major phyla, which were established according to their mode of sexual reproduction or use of molecular data. The Phylum Chytridiomycota (chytrids) is one of the five true phyla of fungi. There is only one class in the Phylum Chytridiomycota, the Chytridiomycetes. The chytrids are the simplest and most primitive Eumycota, or true fungi. The evolutionary record shows that the first, recognizable chytrids appeared during the late pre-Cambrian period, more than 500 million years ago. Like all fungi, chytrids have chitin in their cell walls, but one group of chytrids has both cellulose and chitin in the cell wall. Most chytrids are unicellular; a few form multicellular organisms and hyphae, which have no septa between cells (coenocytic). They reproduce both sexually and asexually; the asexual spores are called diploid zoospores. Their gametes are the only fungal cells known to have a flagellum. The ecological habitat and cell structure of chytrids have much in common with protists. Chytrids usually live in aquatic environments, although some species live on land. Some species thrive as parasites on plants, insects, or amphibians, while others are saprobes. Some chytrids cause diseases in many species of amphibians, resulting in species decline and extinction. An example of a harmful parasitic chytrid is Batrachochytrium dendrobatidis, which is known to cause skin disease. Another chytrid species, Allomyces, is well characterized as an experimental organism. Its reproductive cycle includes both asexual and sexual phases. Allomyces produces diploid or haploid flagellated zoospores in a sporangium. 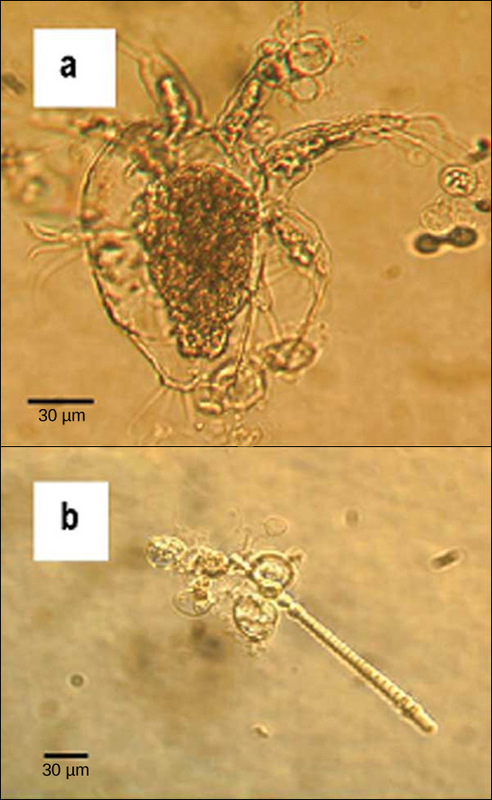 Parasitic chytrids: The chytrid Batrachochytrium dendrobatidis is seen in these light micrographs as transparent spheres growing on (a) a freshwater arthropod and (b) algae. This chytrid causes skin diseases in many species of amphibians, resulting in species decline and extinction. Zygomycota, a small group in the fungi kingdom, can reproduce asexually or sexually, in a process called conjugation. Most zygomycota are saprobes, while a few species are parasites. Zygomycota usually reproduce asexually by producing sporangiospores. Zygomycota reproduce sexually when environmental conditions become unfavorable. To reproduce sexually, two opposing mating strains must fuse or conjugate, thereby, sharing genetic content and creating zygospores. The resulting diploid zygospores remain dormant and protected by thick coats until environmental conditions have improved. When conditions become favorable, zygospores undergo meiosis to produce haploid spores, which will eventually grow into a new organism. The zygomycetes are a relatively small group in the fungi kingdom and belong to the Phylum Zygomycota. They include the familiar bread mold, Rhizopus stolonifer, which rapidly propagates on the surfaces of breads, fruits, and vegetables. They are mostly terrestrial in habitat, living in soil or on plants and animals. Most species are saprobes meaning they live off decaying organic material. Some are parasites of plants, insects, and small animals, while others form symbiotic relationships with plants. Zygomycetes play a considerable commercial role. The metabolic products of other species of Rhizopus are intermediates in the synthesis of semi-synthetic steroid hormones. Zygomycetes have a thallus of coenocytic hyphae in which the nuclei are haploid when the organism is in the vegetative stage. The fungi usually reproduce asexually by producing sporangiospores. The black tips of bread mold, Rhizopus stolonifer, are the swollen sporangia packed with black spores. When spores land on a suitable substrate, they germinate and produce a new mycelium. 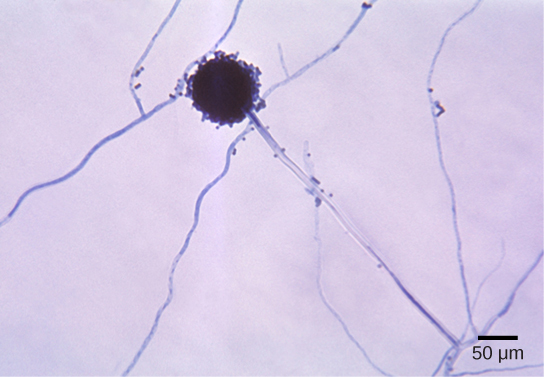 Sporangia of bread mold: Sporangia grow at the end of stalks, which appear as (a) white fuzz seen on this bread mold, Rhizopus stolonifer. The (b) tips of bread mold are the spore-containing sporangia. 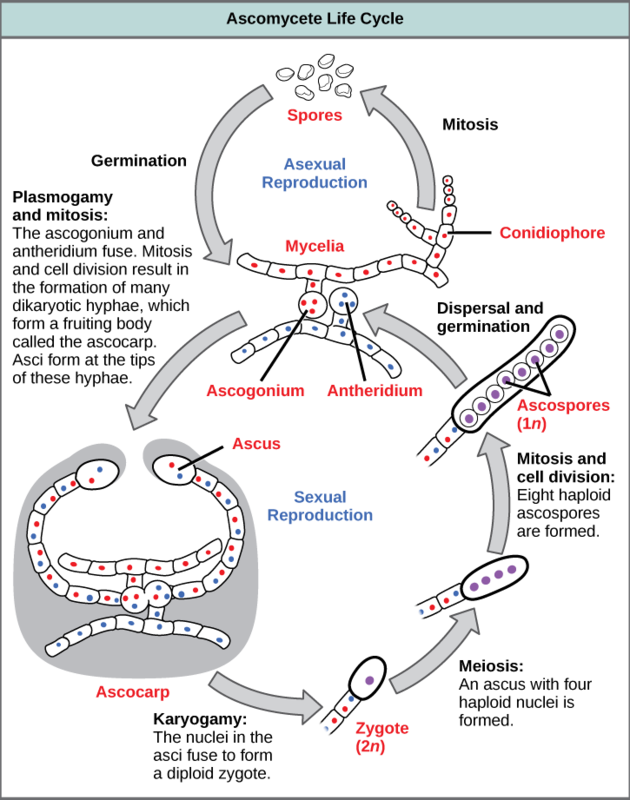 Zygomycete life cycle: Zygomycetes have asexual and sexual life cycles. In the sexual life cycle, plus and minus mating types conjugate to form a zygosporangium. Sexual reproduction starts when conditions become unfavorable. 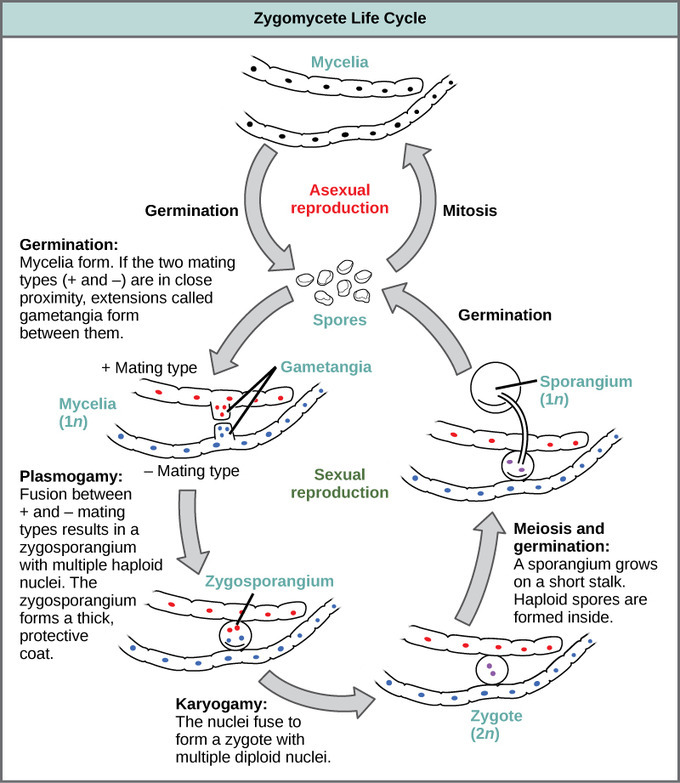 Two opposing mating strains (type + and type –) must be in close proximity for gametangia (singular: gametangium) from the hyphae to be produced and fuse, leading to karyogamy. The developing diploid zygospores have thick coats that protect them from desiccation and other hazards. They may remain dormant until environmental conditions become favorable. When the zygospore germinates, it undergoes meiosis and produces haploid spores, which will, in turn, grow into a new organism. This form of sexual reproduction in fungi is called conjugation (although it differs markedly from conjugation in bacteria and protists), giving rise to the name “conjugated fungi”. Most fungi belong to the Phylum Ascomycota, which uniquely forms of an ascus, a sac-like structure that contains haploid ascospores. Ascomycota fungi are the yeasts used in baking, brewing, and wine fermentation, plus delicacies such as truffles and morels. Ascomycetes are filamentous and produce hyphae divided by perforated septa. Ascomycetes frequently reproduce asexually which leads to the production of conidiophores that release haploid conidiospores. Two types of mating strains, a “male” strain which produces an antheridium and a “female” strain which develops an ascogonium, are required for sexual reproduction. The antheridium and the ascogonium combine in plasmogamy at the time of fertilization, followed by nuclei fusion in the asci. In the ascocarp, a fruiting body, thousands of asci undergo meiosis to generate haploid ascospores ready to be released to the world. 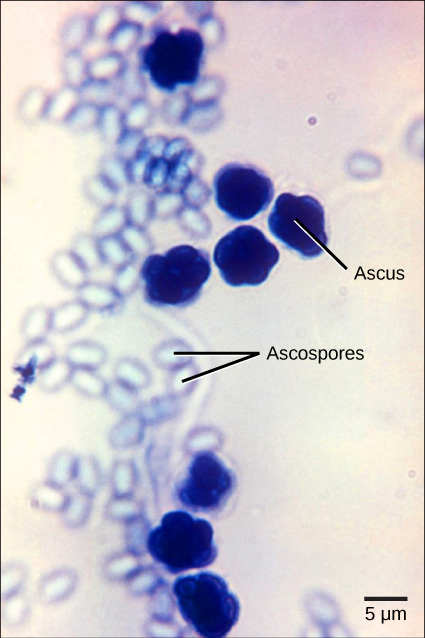 The majority of known fungi belong to the Phylum Ascomycota, which is characterized by the formation of an ascus (plural, asci), a sac-like structure that contains haploid ascospores. Many ascomycetes are of commercial importance. Some play a beneficial role, such as the yeasts used in baking, brewing, and wine fermentation, plus truffles and morels, which are held as gourmet delicacies. Aspergillus oryzae is used in the fermentation of rice to produce sake. Other ascomycetes parasitize plants and animals, including humans. For example, fungal pneumonia poses a significant threat to AIDS patients who have a compromised immune system. Ascomycetes not only infest and destroy crops directly, they also produce poisonous secondary metabolites that make crops unfit for consumption. Filamentous ascomycetes produce hyphae divided by perforated septa, allowing streaming of cytoplasm from one cell to the other. Conidia and asci, which are used respectively for asexual and sexual reproductions, are usually separated from the vegetative hyphae by blocked (non-perforated) septa. Asexual reproduction is frequent and involves the production of conidiophores that release haploid conidiospores. Sexual reproduction starts with the development of special hyphae from either one of two types of mating strains. The “male” strain produces an antheridium (plural: antheridia) and the “female” strain develops an ascogonium (plural: ascogonia). At fertilization, the antheridium and the ascogonium combine in plasmogamy without nuclear fusion. Special ascogenous hyphae arise, in which pairs of nuclei migrate: one from the “male” strain and one from the “female” strain. In each ascus, two or more haploid ascospores fuse their nuclei in karyogamy. During sexual reproduction, thousands of asci fill a fruiting body called the ascocarp. The diploid nucleus gives rise to haploid nuclei by meiosis. The ascospores are then released, germinate, and form hyphae that are disseminated in the environment and start new mycelia. Release of ascospores: The bright field light micrograph shows ascospores being released from asci in the fungus Talaromyces flavus var. flavus. Lifecycle of an ascomycete: The lifecycle of an ascomycete is characterized by the production of asci during the sexual phase. The haploid phase is the predominant phase of the life cycle. The basidiomycota are mushroom-producing fungi with developing, club-shaped fruiting bodies called basidia on the gills under its cap. The majority of edible fungi belong to the Phylum Basidiomycota. The basidiomycota includes shelf fungus, toadstools, and smuts and rusts. Unlike most fungi, basidiomycota reproduce sexually as opposed to asexually. Two different mating strains are required for the fusion of genetic material in the basidium which is followed by meiosis producing haploid basidiospores. Mycelia of different mating strains combine to produce a secondary mycelium that contains haploid basidiospores in what is called the dikaryotic stage, where the fungi remains until a basidiocarp (mushroom) is generated with the developing basidia on the gills under its cap. The fungi in the Phylum Basidiomycota are easily recognizable under a light microscope by their club-shaped fruiting bodies called basidia (singular, basidium), which are the swollen terminal cell of a hypha. 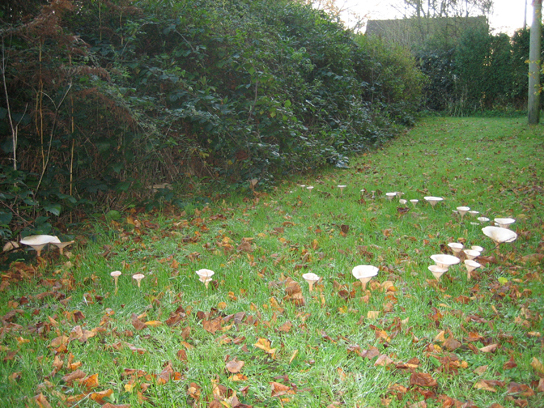 The basidia, which are the reproductive organs of these fungi, are often contained within the familiar mushroom, commonly seen in fields after rain, on the supermarket shelves, and growing on your lawn. These mushroom-producing basidiomyces are sometimes referred to as “gill fungi” because of the presence of gill-like structures on the underside of the cap. The “gills” are actually compacted hyphae on which the basidia are borne. This group also includes shelf fungus, which cling to the bark of trees like small shelves. In addition, the basidiomycota includes smuts and rusts, which are important plant pathogens, and toadstools. Most edible fungi belong to the Phylum Basidiomycota; however, some basidiomycetes produce deadly toxins. For example, Cryptococcus neoformans causes severe respiratory illness. Fruiting bodies of a basidiomycete: The fruiting bodies of a basidiomycete form a ring in a meadow, commonly called “fairy ring.” The best-known fairy ring fungus has the scientific name Marasmius oreades. The body of this fungus, its mycelium, is underground and grows outward in a circle. As it grows, the mycelium depletes the soil of nitrogen, causing the mycelia to grow away from the center, leading to the “fairy ring” of fruiting bodies where there is adequate soil nitrogen. The lifecycle of basidiomycetes includes alternation of generations. Spores are generally produced through sexual reproduction, rather than asexual reproduction. The club-shaped basidium carries spores called basidiospores. In the basidium, nuclei of two different mating strains fuse (karyogamy), giving rise to a diploid zygote that then undergoes meiosis. The haploid nuclei migrate into basidiospores, which germinate and generate monokaryotic hyphae. The mycelium that results is called a primary mycelium. Mycelia of different mating strains can combine and produce a secondary mycelium that contains haploid nuclei of two different mating strains. This is the dikaryotic stage of the basidiomyces lifecyle and it is the dominant stage. Eventually, the secondary mycelium generates a basidiocarp, which is a fruiting body that protrudes from the ground; this is what we think of as a mushroom. The basidiocarp bears the developing basidia on the gills under its cap. 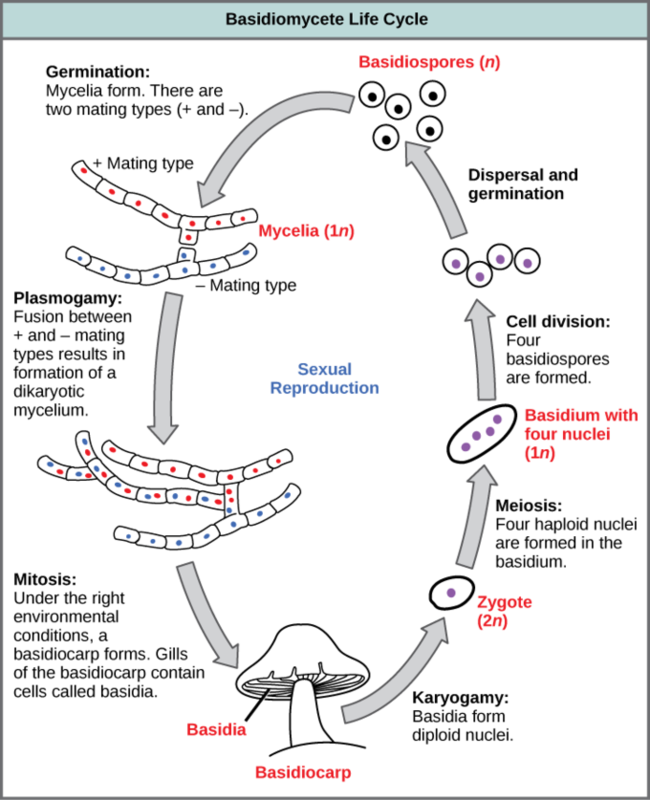 Lifecycle of a basidiomycete: The lifecycle of a basidiomycete alternates generation with a prolonged stage in which two nuclei (dikaryon) are present in the hyphae. Phylum Deuteromycota is a polyphyletic group of asexually-reproducing fungi that do not display a sexual phase; they are known as imperfect. Deuteromycota do not possess the sexual structures that are used to classify other fungi. Most deuteromycota live on land; they form visible mycelia with a fuzzy appearance called mold. Recombination of genetic material is known to take place between the different nuclei after some hyphae recombine. Imperfect fungi are those that do not display a sexual phase. They are classified as belonging to the form Phylum Deuteromycota. Deuteromycota is a polyphyletic group where many species are more closely related to organisms in other phyla than to each other; hence it cannot be called a true phylum and must, instead, be given the name form phylum. Since they do not possess the sexual structures that are used to classify other fungi, they are less well described in comparison to other divisions. Most members live on land, with a few aquatic exceptions. They form visible mycelia with a fuzzy appearance and are commonly known as mold. Molecular analysis shows that the closest group to the deuteromycetes is the ascomycetes. In fact, some species, such as Aspergillus, which were once classified as imperfect fungi, are now classified as ascomycetes. Example of an imperfect fungus: Aspergillus niger is an imperfect fungus commonly found as a food contaminant. The spherical structure in this light micrograph is a conidiophore. Reproduction of Deuteromycota is strictly asexual, occuring mainly by production of asexual conidiospores. Some hyphae may recombine and form heterokaryotic hyphae. Genetic recombination is known to take place between the different nuclei. Imperfect fungi have a large impact on everyday human life. The food industry relies on them for ripening some cheeses. The blue veins in Roquefort cheese and the white crust on Camembert are the result of fungal growth. The antibiotic penicillin was originally discovered on an overgrown Petri plate on which a colony of Penicillium fungi killed the bacterial growth surrounding it. Many imperfect fungi cause serious diseases, either directly as parasites (which infect both plants and humans), or as producers of potent toxic compounds, as seen in the aflatoxins released by fungi of the genus Aspergillus. Glomeromycetes are an important group of fungi that live in close symbiotic association with the roots of trees and plants. Most glomeromycetes form arbuscular mycorrhizae, a type of symbiotic relationship between a fungus and plant roots; the plants supply a source of energy to the fungus while the fungus supplies essential minerals to the plant. Glomeromycota that have arbuscular mycorrhizal are mostly terrestrial, but can also be found in wetlands. The glomeromycetes reproduce asexually by producing glomerospores and cannot survive without the presence of plant roots. DNA analysis shows that all glomeromycetes probably descended from a common ancestor 462 and 353 million years ago. The classification of fungi as Glomeromycota has been redefined with adoption of molecular techniques. In the kingdom Fungi, the Glomeromycota is a newly-established phylum comprised of about 230 species that live in close association with the roots of trees and plants. Fossil records indicate that trees and their root symbionts share a long evolutionary history. It appears that most members of this family form arbuscular mycorrhizae: the hyphae interact with the root cells forming a mutually-beneficial association where the plants supply the carbon source and energy in the form of carbohydrates to the fungus while the fungus supplies essential minerals from the soil to the plant. This association is termed biotrophic. The Glomeromycota species that have arbuscular mycorrhizal are terrestrial and widely distributed in soils worldwide where they form symbioses with the roots of the majority of plant species. They can also be found in wetlands, including salt-marshes, and are associated with epiphytic plants. Glyomeromycetes and tree roots: This image illustrates the bitrophic relationship between a glomeromycota (Gigaspora margarita) and the roots of a plant (Lotus corniculatus). The glomeromycetes do not reproduce sexually and cannot survive without the presence of plant roots. They have coenocytic hyphae and reproduce asexually, producing glomerospores. The biochemical and genetic characterization of the Glomeromycota has been hindered by their biotrophic nature, which impedes laboratory culturing. This obstacle was eventually surpassed with the use of root cultures. With the advent of molecular techniques, such as gene sequencing, the phylogenetic classification of Glomeromycota has become clearer. The first mycorrhizal gene to be sequenced was the small-subunit ribosomal RNA (SSU rRNA). This gene is highly conserved and commonly used in phylogenetic studies so it was isolated from spores of each taxonomic group. Using a molecular clock approach based on the substitution rates of SSU sequences, scientists were able to estimate the time of divergence of the fungi. This analysis shows that all glomeromycetes probably descended from a common ancestor 462 and 353 million years ago, making them a monophyletic lineage. A long-held theory is that Glomeromycota were instrumental in the colonization of land by plants.